A lot of my gaming friends2 picked up The Division when it first came out and then dropped off when the game became a bit of a mess. The Division recently got an update patch that added some new content and fixed some long time plaguing issues. These fixes have started to bring back players and a lot of them are asking "I haven’t played in a long time, what loot is good now? I’m not sure how to set up my characters anymore." The loot drops are a continuous flow in The Division, so much so that sometimes it's hard to understand what you should keep, hold on for later, and dismantle/sell now for resources. I'll be using Destiny (D1) as a comparison to information a player will see in The Division (TD) since that's the audience I'm trying to speak to. Everything I'm about to talk about assumes your Agent is L30, you have completely unlocked the Base of Operations (BoO)1, and can play on World Tier 5 (WT5). If you don't meet these requirements, find a friend that is and power level3 until you get all 3 completed. Firearms: Higher stat will improve the damage output from your Agent. Stamina: Higher stat will improve the damage your Agent can receive. 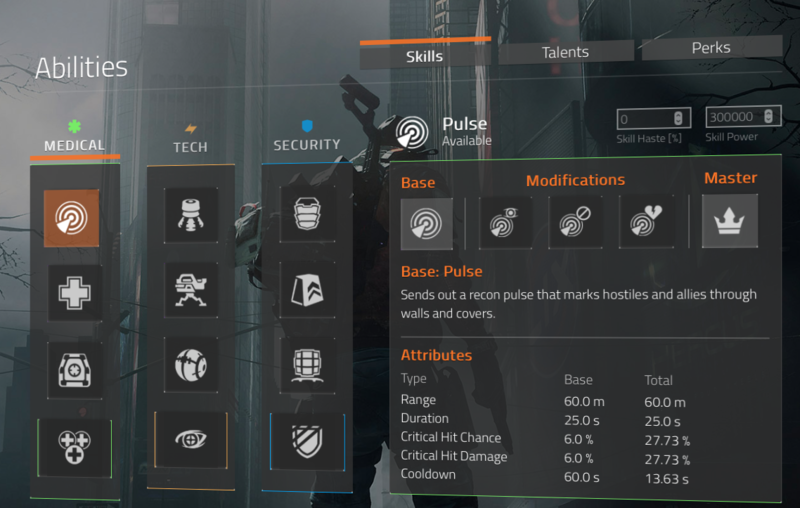 Electronics: Higher stat affects how effective your Skills are (see below). The easiest way to think about your characters stats in TD is in D1 your character had 3 main stats: Int / Dis / Str. Those stats dictated how fast you would get your grenade to recharge, how long it took to fill your super, etc. While the stats between D1 and TD don't match up one to one, it should set the tone of how they work in TD. The detail that was never fully explained as I played TD was how these stats interact with other the related attributes: DPS / Health / Skill Power. These numbers are just as important as your base stats because the attribute numbers dictate how your character interacts with the gaming environment. Just like in D1, your primary stats in TD come from the gear you equip on your Agent. As more powerful gear (chest, backpack, holster, etc) is equipped, your stats will go up and/or change. 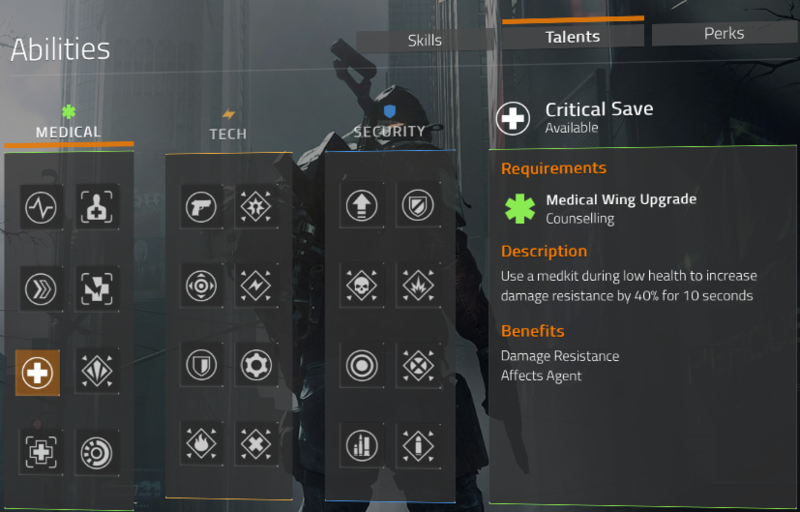 You can adjust your stats even further with weapon mods and addition attributes on your equipment. More on weapon mods later. This list is what you're working on when you unlock the BoO. As you unlock the BoO, you will be given access to new Skills, Talents and Perks. This is why I recommend having your BoO 100% unlocked before moving on. Skills are a set of abilities in TD that are the closest equivalent to D1's grenade/melee/super cool downs. The Skills your Agent can use are grouped into 2 normal skills and 1 signature skill. The 2 normal skills have a cool down equivalent to D1's grenade and melee cool down. Your signature skill is more powerful, like your D1 super, and therefore has a longer cool down. All skills are grouped by the talent resources in the BoO: Medical, Tech, and Security. Pulse Sends out recon pulse that marks hostiles and allies through walls and covers. First Aid Launches a localized device that heals all allies within a small radius. Support Station Drops a support station that heals allies and can be used to revive downed allies. Sticky Bomb Fires a bomb that sticks to most surfaces and explodes when detonated remotely. Turret Deploys a stationary turret that attacks nearby hostiles until it is destroyed or its battery runs out. Seeker Mine Releases an automated mine that seeks out hotile targets before exploding on proximity. Smart Cover Reinforces a cover, increasing the user’s damage and decreasing the incoming damage for all allies behind it. Mobile Cover Creates a temporary cover for one person, which provides standard cover protection until destroyed. Recovery Link Heals and cures the users and nearby allies. Revives downed allies within range. Survivor Link Increases damage resistance and speed for the users and nearby allies. Tactical Link Increases damage and critical hit chance to user and all nearby allies. Critical Save: Use a medkit during low health to increase damage resistance by 40% for 10 seconds. Tech Support: Kill a hostile while any skill is deployed to extended any active skills duration by 10%. On the Move: Kill a hostile while moving to reduce incoming damage by 30% for 10s. One is None: Headshot a hostile to have a 50% chance of not consuming the bullet. Once you move into a group or PVP, the talent selection would change based on the type of gear and character you're playing - healer, tank, DPS, sniper, etc. These are passive abilities that don't require any interaction or selection by you for your character. These are just additional perks your character has as your Agent levels up. 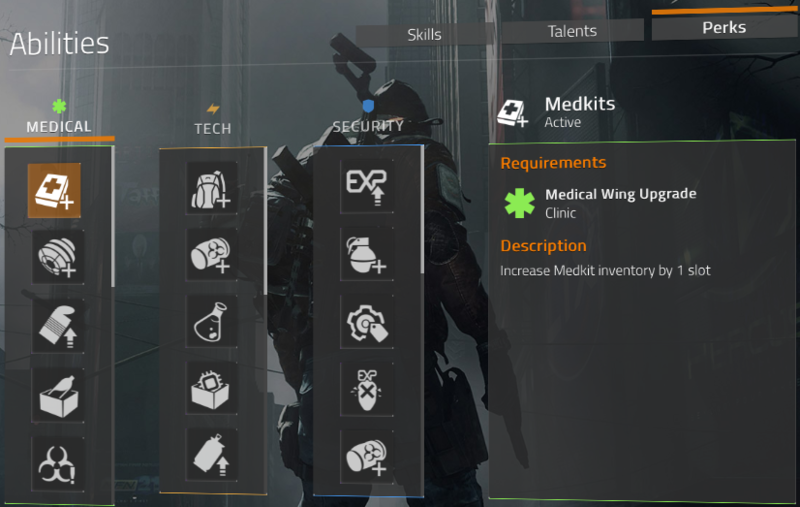 Medkits Increases Medkit inventory by 1 slot. Protective Measures Increases Virus Protection by 1. Supplier Collect canned food, water, energy bar and soda in the Supply Line once per hour. Contamination Intel Reveal all contaminated areas on the map. Hazardous Materials Increases Dark Zone inventory by 1 slot. Rigger Collect fabric (crafting materials) in the Medical Wing once per hour. Credit Increase credit gains by 10%. Inventory Increase inventory by 10 slots. Division Tech Materials Convert Division Tech crafting materials into other materials at the crafting station. Engineer Collect electronics (crafting materials) in the Tech Wing once per hour. Soda Increase Soda consumable effect duration by 10s. Water Increase Water consumable effect duration by 10s. Craftsman Collect tools (crafting materials) in the Tech Wing once per hour. Energy Bar Increase energy bar effect duration by 5s. Resource Assessment Reveal all Division Tech crafting nodes on the Dark Zone map. Stat Switch Unlock item stat switching at the Recalibration Station. Dark Zone Funds Increase looted Dark Zone fund gains by 10%. Stash Increase stash by 10 slots. Experienced Agent Increase XP gained from all activities by 10%. Grenades Increase the grenade inventory by 1 slot. Advanced Weaponry Unlock advanced weapons vendor in the Security Wing. Combat Veteran Increase XP gained from accolades by 25%. Black Market Vendor Unlock Dark Zone fund purchases in the Base of Operations. Clothes Vendor Unlock a clothes vendor in the Base of Operations. Explosive Bullets Increase Explosive Bullets effect duration by 10s. Gunsmith Collect weapon parts (crafting materials) in the Security Wing once per hour. Scavenger Collect items from the scavenger box in the Security Wing once per hour. Incendiary Bullets Increase Incendiary Bullets effect duration by 10s. Special Ammo Collect incendiary and explosive bullets (ammo) in the Supply Line once per hour. Shooting Range Train in Marksmanship at the Shooting Range. Intel Discovery Completing Side Missions & Encounters, reveal all undiscovered Intel on the map in that zone. Collector Increases Scavenging by 15%. Next post, understanding how your equipment and gear influence your character.